Don’t ya’ just love it when even the market forces so cherished by the ideologues on the right tell them that their head-in-the-sand environmental denials are all wet? As we reported last week, ExxonMobil is now calling for strong government action to address the climate change crisis even as members of the Flat Earth Society in places like the Art Pope Empire deny that global warming is occurring or, if they concede it is, that it has anything to do with carbon emissions. 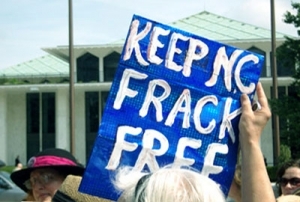 “Fracking can significantly decrease home values, especially in areas that use well water, according to a new study from Duke University. Ya’ got that fracking fans? Not only are the experts who devote their lives to preserving the planet anti-fracking, so is the genius of the free market. Who would have guessed that people don’t want live where their drinking water will be poisoned with toxic chemicals? The bottom (and hopeful) line: As with so many disastrous environmental practices, polluter-funded denials can only work so long. It’s too bad that it comes to this, but at some point, the facts on (and, in this case, under) the ground become so obvious that even capital starts to say “no way.” Americans are starting to vote with their feet when it comes to fracking. Let’s hope this powerful trend helps keep this destructive phenomenon out of North Carolina permanently. Fracking brings contaminated ground water, poisoned air, three times normal asthma, increased ozone, exposure to carcinogenic benzene, and increased global warming. Please share so that others can see this. Everyone deserves a chance to understand what scientists have learned.